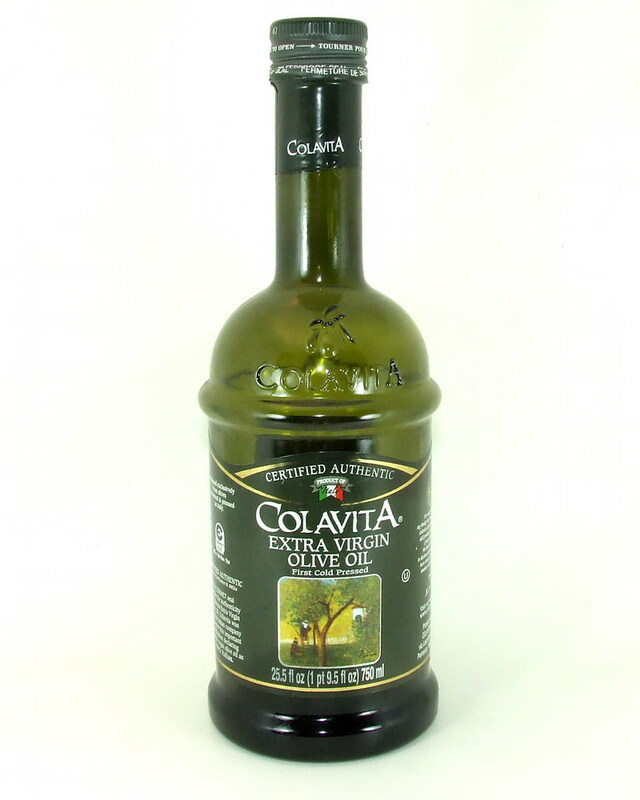 From the Garden Variety pantry: Colavita Extra Virgin Olive Oil (purchased at Walmart). Garden to Table looks at homegrown, organic and natural foods, ingredients, recipes and preparation tips. Here, our food growing and processing expert Alan Jackson shares a few things you should know about the impact of big food concerns on the “healthy” olive oil in your kitchen. Houston, we have a problem! And the situation is just as dire as the struggle for survival by astronauts Ryan Stone (Sandra Bullock) and Matt Kowalski (George Clooney) in the hit 3-D sci-fi thriller “Gravity.” They had no way home, and we have no decent olive oil. It took eons, but olive oil finally crept into North American acceptance due to its health attributes. And now, seemingly with a snap of the fingers, there is almost no olive oil fit for human consumption available in grocery aisles. So, who do we have to blame for the rather sudden absence of good, healthy olive oil? It can only be attributed to the rise of food conglomerates and their insatiable lust for profits. Unlike with other vegetable oils, the ripe olive only needs pressing and bottling to be ready for market. Sounds easy, and it is, and by employing this simple, age-old process all the important nutrients are conserved: the anti-oxidants polyphenols and the natural vitamin E. Olive oil lowers both blood pressure and cholesterol and even reduces the incidence of some cancers. Consumers know this through fancy marketing campaigns and supermarkets have responded by filling their shelves with numerous brands. The problem is, the vast majority of available products are not what most people believe they are, as most of the stuff in those bottles is so loosely related to real olive oil that it may as well be space shuttle fuel. Historically, ripe olives are picked by hand so as not to damage or bruise the fresh fruit, which was then placed into containers with holes to allow air circulation. Before milling, twigs and stems were removed and the resulting paste pressed into oil, usually within 48 hours. Then along came the big boys with bigger ideas to squeeze more money from the ancient fruit. They shake the olives down ripe or not, scoop them into dump trucks and place the harvest into huge moldy piles to await processing by a continuous centrifuge that uses hot water to extract every drop of oil. Polyphenols, the water-soluable anti-oxidants that give olive oil its healthful benefits, are lost during this process, which also drastically reduces the shelf life from years to months. Members of the California Olive Oil Council, both the U.S. and Canada are obliged to make the words “virgin and extra virgin olive oil” represent all olive oil with a free oleic acid level of no more than one percent. That’s no obstacle for the major players, since all they have to do is use solvents when refining poor-quality, high-acid oils to lower acidity below the required threshold—apparently a common practice. While a few readers may remember the great tropical oil scandal of the 1970s and ’80s, when the soybean industry concocted a super-successful campaign to convince consumers that coconut and palm oils were causing heart disease, that outrage was trivial when compared to what European investigators are uncovering about olive oil. It may be the greatest food scandal in recorded history, since it appears that almost every large corporation involved in the processing of olive oil has been cutting their product with highly-refined hazelnut oil from Turkey and sunflower seed oil from Argentina. That’s right. Your favorite brand of olive oil is probably not only nutritionally lacking, chances are it is being diluted with cheap nut oils that may be bad for you (especially for those with nut allergies)—in some cases, they have been sitting in hot ship cargo holds for weeks on end on the way to olive oil producers. Yes, it is fraud, pure and simple, but that is of little concern to those involved. So buyer beware: The only way around inferior oil is to find the “good stuff.” It’s not rocket science, but it requires an informed shopper. Tom Mueller, a writer whose work has appeared in The New Yorker, the New York Times Magazine and National Geographic, is on a mission to reveal the truth about the Mediterranean and West Coast staple. His book, “Extra Virginity: The Sublime and Scandalous World of Olive Oil,” is an eye-opening expose on industry corruption that serves as a manual for those seeking to separate fact from fiction. The outgrowth Web site, Truth in Olive Oil, raises awareness and has a must-read olive oil buyer’s guide. Ambitious gardeners and DIY food enthusiasts need not bother with head-scratching shopping trips. Though best suited for warm, dry climates, with care some cold-tolerant olive trees can be grown at home, especially smaller, fast-growing varieties like Arbequina or the semi-dwarf Arbosana, which can bear fruit in as little as two years from planting, and are container-friendly, meaning they can be brought indoors in the winter. If you’d like to try your hand without waiting, California grower Penna sells fresh olives (picked daily) ready for pressing. In theory, any method can be used to extract the oil from olives—from pounding olives in a burlap bag with a sterile mallet to squeezing between cast-iron skillets to grinding them with a mortar and pestle—but home-sized pneumatic presses are available for a price and some creative types have had success using simple hand-cranked meat grinders. This entry was posted in Cooking, Edible Garden, Food and tagged A.H. Jackson, buying olive oil, Canadian food, Canadian Food Encyclopedia, Extra Virginity The Sublime and Scandalous World of Olive Oil, growing olives, making olive oil, olive oil, olive oil fraud, planting olive trees, Tom Mueller, Truth in Olive Oil. Bookmark the permalink. While presenting a rather dire state of olive oil, this article offers no information whatsoever about how to procure quality olive oil. Thanks. Thank you for commenting. In the editor’s reference notes following the article, there is a link to Tom Mueller’s Truth in Olive Oil site, which features an olive oil buyer’s guide, detailing how to obtain quality products. Wow! I feel a little silly not thinking about this before – thanks for the heads up! And now that you mention it, it is not surprising at all. Sad, but true… Thanks for the link to the olive oil site – I’m on my way. So…Colavita is pictured because it is good? Or bad? And while it may be that the book tells which oils are best, it is also true that the article does not. Colavita, which didn’t rate as a “good” oil in testing by the University of California, Davis, is only pictured as an example of what’s in our own pantry. Although Alan’s article did not cover which oils are best, Tom Mueller’s online reference, How to Buy Great Olive Oil can be read here.